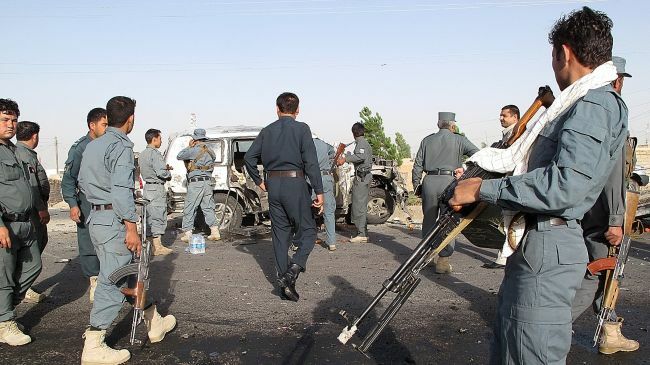 JNN 26 June 2014 Kabul : Afghanistan’s Interior Ministry says about 100 Taliban Terrorists have been killed in clashes with security forces in the southern province of Helmand. Ministry spokesperson Siddiq Siddiqi told AFP on Wednesday that about 100 terrorists were killed in five days of fighting with the government forces in the province. “We are reinforcing Afghan national security forces and have suffered no major loss of territory. About 100 Taliban have been killed so far,” Siddiqi said. Meanwhile, local officials said that 800 militants were involved in attacks centered on the Sangin district of Helmand Province. “About 800 fighters started to storm four districts of Helmand,” the provincial governor’s spokesperson Omar Zwak said, adding that at least 21 Afghan forces and about 40 civilians have been killed since the offensives began on Sunday, June 22. A government official confirmed the figure, according to the AFP. Zwak said reinforcements had been sent to repel the attacks in Sangin, Nowzad, Kajaki and Musa Qala districts, where 2,000 families have fled the violence. Helmand, which sits on the border with Pakistan, has been a focal point of Taliban activity. Last week, three US soldiers were killed in an improvised explosive device (IED) attack in the Nad Ali district of Helmand. This entry was posted in Asia Pacific and tagged Afghan forces, Helmand Province, Helmund, Interior Ministry, security forces, Siddiq Siddiqi, taliban, US Forces Withdrawl. Bookmark the permalink.